The General Assembly is back and ready for business! Since meeting for the long session on Jan. 11, the Assembly has been coming together for regular meetings and to work on the budget. Currently, one bill, H.B. 135, addresses the need for bike safety to be added to the public school curriculum. The General Assembly asserts that the public school community upholds the responsibility to ensure that each child is able “to learn, to achieve, and to fulfill his or her potential.” The bill, short-titled “Technical Changes to Courses of Study Statute,” will ensure that the state Board of Education enforces and reviews materials related to bicycle safety education, among a list of other topics. We thank bill sponsors Reps. Jeffrey Elmore, Linda P. Johnson and Debra Conrad for including bike safety. Implementing bike safety into the K-12 curriculum is sure to have a lasting impact on transportation safety for everyone. We are hoping that the N.C. DOT will get their requested expansion budget for bicycle and pedestrian planning grants and for “Watch for Me” safety programming. If the state does do a Transportation Bond, we want to make sure bicycle and pedestrian infrastructure is included! Check to see if your senator or representative is on the House Transportation Committee or Senate Transportation Committee. Leadership in the House includes Reps. Hastings, Iler, Shepard, Torbett and from Appropriations, Rep. Presnell. On the Senate side, chairs include Sens. Davis and McInnis and from Appropriations, Sen. Meredith. 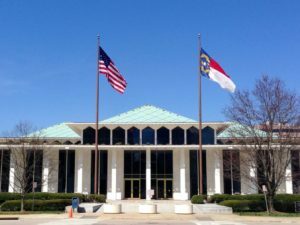 By supporting BikeWalk NC, you are supporting a team of advocates who work to make sure bills do not limit bicycling or make it less safe for the community. We hope everyone comes out to Lobby Day on April 5 to remind legislators that bicycling and walking are vital for health and for supporting community values. This opportunity is an excellent way to participate in government by reminding legislators that bicycling and walking are viable and legitimate transportation modes, and to thank them for the recent safety improvements in House Bills 959 (summer 2016) and 135 (current session). For more details and to register, please visit our Eventbrite invitation.